WASHINGTON (CNN) -- U.S. Defense Secretary Robert Gates has signed a deployment order to move an additional 3,000 troops to Afghanistan next year, according to U.S. military officials. 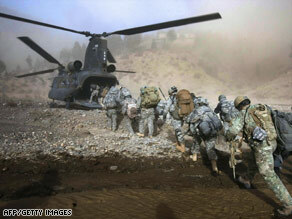 Helicopters are the main transportation of the U.S. military in Afghanistan, with its high mountain terrain. The troops will be part of a combat aviation brigade, the latest approved by Gates for the expected build-up of U.S. troops in Afghanistan throughout next year. Earlier this year, the U.S. commander in Afghanistan, Gen. David McKiernan, requested at least 20,000 additional troops be sent there to fight the increasing violence by the resurgent Taliban forces in the southern and eastern parts of the country. The officials could not say what units are being tapped to go because those units are now being told of their deployment and the announcement has not yet been made public. The aviation brigade will send a number of much-needed helicopters to the region. Helicopters are the main transportation of the U.S. military in Afghanistan, where high mountain roads and passes make it difficult for large transport vehicles to move troops and supplies around the country. There are more than 30,000 U.S. troops in Afghanistan. Meanwhile, a Dutch soldier was killed Friday in southern Afghanistan, the NATO command confirmed. The soldier died in an improvised explosive device strike, according to a news release from NATO's International Security Assistance Force. "Our sincere condolences and sympathies are with the family and friends of this brave soldier, especially during this holiday season," said ISAF spokesman Capt. Mark Windsor Royal Navy. "This soldier's death is an irreplaceable loss to all of us who fight for the peace and stability of Afghanistan. ISAF will continue to fight for the cause for which this brave soldier gave his life." Eighteen Dutch troops have died in the Afghan conflict, according to a CNN count of casualty figures.